What was I doing, at the age of eighteen, on the shore of that lake, in that fashionable spa resort? Nothing. I was living in a boarding house, the Lindens, on Boulevard Carabacel. I could have opted for a room in town, but I preferred to be on high ground, steps away from the Windsor, the Hermitage, and the Alhambra, whose luxury and dense gardens reassured me. A young man with time on his hands (and money in his pockets), with his own reasons for being away from Paris, Victor is whiling his time away in a small town on the banks of Lake Geneva, desperate for something to enliven his stay. Luckily, that something arrives soon enough in the form of an encounter with two people who are to play a large role in his summer. Yvonne is a beautiful young actress of local origins, accompanied by a rather dignified Great Dane; Dr. René Meinthe is gay, flighty and slightly mysterious – the three become firm friends, and a summer of fun ensues. However, as much as they all enjoy their time in the sun, we’re fully aware that summer never lasts forever. It remains to be seen whether the relationships will endure once the season begins to change. At this point, the story runs pretty much as you would imagine. We have a couple of spoilt rich kids playing around and having fun, using their wealth, youth and good looks to enjoy the summer. There is a much darker side to the novel, though, and the amusement is usually short-lived. All of the main protagonists are hiding secrets, using their time in the sun to avoid the problems of their real life. Victor claims to be a count, but it’s clear that his background is highly dubious. Yvonne is reluctant to open up about her origins, and the more he gets to know her, the more doubts the narrator has about her ‘film’. However, it’s perhaps René who has the most to hide. Towards the end of the book, his two young friends are shown glimpses of the life he spends on the other side of the border, one which isn’t quite as happy as they might have expected. The main action in Villa Triste is set in 1963, when France was experiencing issues with its colony in Algeria. Victor’s decision to base himself near the Swiss border is a deliberate one as he’s what Americans would call a ‘draft dodger’ – he only has to cross the lake, and he’s free… Yet this is not the only mention of the conflict in North Africa as René is also involved in his own way. The mysterious phone calls and the visits he receives at night are also connected with the Algerian fight for independence – although we’re never quite sure what role he is actually playing. There’s also a lot to like here in terms of style. 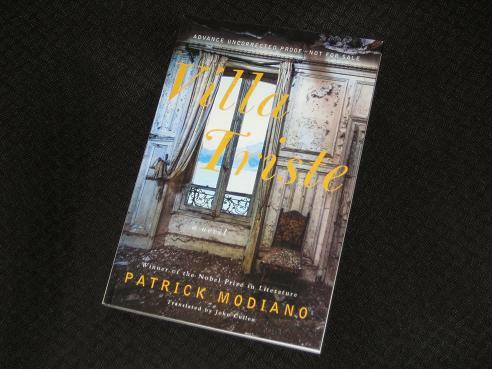 Much of the book appears cinematic, and Modiano frequently uses the present tense, making the story slightly more engaged with the present moment than can be the case with his work (often, he’s very much looking back). While we have the humour, slapstick at times, characteristic of his early work (a good example of this is the character of the depressive dog…), this is still classic Modiano, with the usual lists and obsession with a missing father. Villa Triste is a full novel, and yet we’re still left with the feeling that there are gaps everywhere, with much of what we want to know left unspoken. funny that we reviewed it both the same day! My review is shorter, but I think we agree on the same points. And tomorrow my review on Lacombe Lucien – we are both Other Press fans, aren’t we?